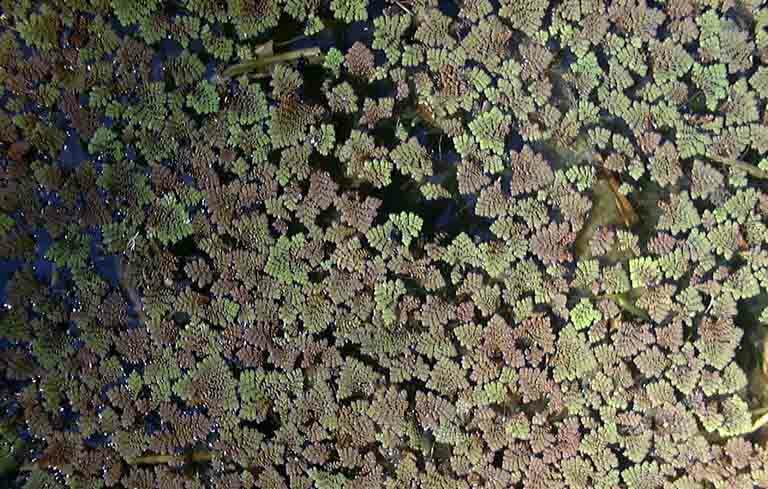 Azolla pinnata is a small fern with a triangular frond that measures up to 1 in. (2.5 cm) in length and floats on the water. The frond is made up of many rounded or angular overlapping leaves each 0.08 in. (0.2 cm.) long. They are green, blue-green, or dark red in color and coated in tiny hairs, giving them a velvety appearance. The hairs make the top surface of the leaf water-repellent, allowing the plant to float. Ferns do not produce a flower. The small fruit is a capsule that can contain up to 64 small spores.